A wide selection of book covers including spines, each approx. 1" tall. Sizes vary slightly, so you can make a little library that looks realistic. 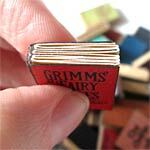 See a video tutorial by Jessica on how to make little books (that can be opened!) using this collage sheet.